Divorce in New Mexico doesn’t have to be a mysterious or frightening experience. You can help yourself get through it with a minimum of fuss by educating yourself about what the laws are, and what you can expect to happen. We have put together a collection of resources to explain New Mexico divorce law, and to give you answers to questions people often have about the process. Our Divorce Legal Guide explains the law involved with getting a divorce in New Mexico. Knowing about the law can help take some of the stress out of the process. Do you have questions about divorce in New Mexico? Most people do. Our Common Questions section gives you the answers to the questions most often asked about divorce. Our Divorce Articles will give you a broad overview of some of the important aspects of divorce in New Mexico, like child support, developing a parenting plan, and property division. In addition to the many resources within this website, DivorceNM has made available Divorce and Custody Calculators to help guide you through the process of a divorce or custody and parentage case. Do you want to learn more about family law to better understand your options for a divorce in New Mexico? Read our blog – written by our experts who know New Mexico family law. DivorceNM.com is pleased to recommend a list of selected books as great resources to help you with your divorce and co-parenting. All book may be purchased through Amazon. DivorceNM.com is affiliated with partners who are ready to assist you with your divorce and child custody case, as well as organizations helping us provide this service to the New Mexico community. 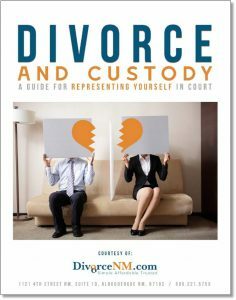 This free Guide will help you through your New Mexico divorce or custody case by providing general information about the process, what to expect, and tips for to help as you prepare for your day in court. When you download this free Guide, you will be invited to schedule a free consultation (up to 15 minutes) with a lawyer who understands New Mexico Family Law through our partnership with the Family Law Resource Group. Download the Guide today!